This weekend, I showed the 2010 documentary film, Gasland, to members of my shul. It was planned as a Tu B’Shevat educational event before the Pennsylvania General Assembly passed a natural-gas drilling policy last week and before Governor Tom Corbett signed the bill last night. Pennsylvania now joins more than 25 states in imposing a levy on natural gas drillers. Hydraulic fracturing, commonly known as fracking, involves new technology, using horizontal drilling/high volume hydraulic fracturing that is different from conventional drilling and is much riskier. In horizontal drilling, the drill bit is turned sideways to penetrate long distances from the vertical well. Massive amounts of water are pumped into the ground at extremely high pressure to fracture the rock According to Dr. Mirele Goldsmith of Jews Against Hydrofracking, the industry is resorting to this type of drilling because deposits accessible by conventional drilling have been used up. This method uses benzene, diesel, and formaldehyde as some of the hundreds of chemicals that are extremely hazardous to human health. In 2009, the filmmaker, Josh Fox, learned that his home in the Delaware River Basin was on top of the Marcellus Shale, a rock formation containing natural gas that exists across Pennsylvania and huge stretches of the Northeast. He was offered $100,000 to lease his land for a method of drilling developed by Halliburton and he soon discovered that this was part of a 34-state drilling campaign, the largest domestic natural gas drilling boom in history. More than 3,000 such wells have already been drilled in Pennsylvania. Fox traveled to communities where the contamination of their drinking water has caused illnesses from headaches to asthma to the loss of hair in their animals. 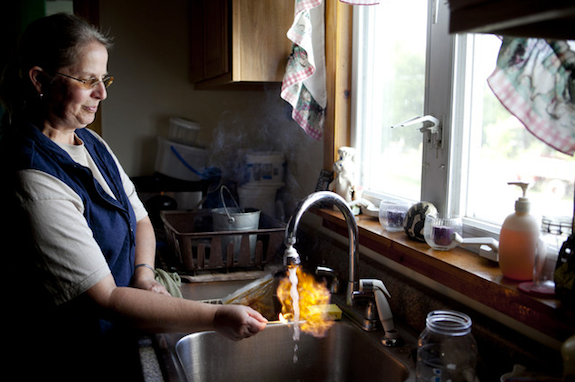 In Dimock, PA, the residents are able to light their tap water on fire. Contaminated water from fracking has been identified in Colorado, New Mexico, Alabama, Ohio as well as Pennsylvania. The State House voted 101-90 for the bill on Wednesday, February 8, after a 31-19 vote in the State Senate on Tuesday. As signed by Governor Corbett, the bill exacts a new fee on natural-gas drillers. The bill also: establishes a 500-foot setback between wells and buildings; requires a 300-foot setback between wells and waterways; and prohibits local governments from using zoning ordinances to ban gas drilling, and allows drilling in all zones. Pennsylvania is the largest natural-gas-producing state that had not imposed a levy on drilling. The new bill will add a tax, beginning with a per-well fee between $40,000 and $60,000 in the first year after a well is drilled, which will decline to between $5,000 and $10,000 per well by the 15th and final year. The fee will vary with the cost of gas per year and will be set by the Public Utility Commission, which regulates utility companies. The Forward reported last summer that of the 30 Jewish summer camps that sit above the Marcellus Shale, four camps in Wayne County, PA, had signed leases with Hess Corporation. The New Jersey YMHA-YWHA Camps received $400,000 for a lease on property that houses two summer camps. The B’nai B’rith Henry Monsky Foundation received a bonus of $115, 248 upon signing. In Pennsylvania, there are already wells within 2 miles to 320 daycare facilities, 67 schools, and 9 hospitals, cites Dr. Goldsmith from state documents. She reports that more than 50 rabbis have signed a letter, sent to the Delaware River Basin Commission, about their concerns about fracking. A reader asked why did any legislators vote no on this bill? According to The Pocono Record [2/12/2012], the Democrats who did not vote for the bill did so because the bill asks the industry to pay a meager price for extracting a valuable natural resource while it strips municipal officials of authority to control drilling.